This badge was issued to Jude Patterson on 21 Sep 2018. 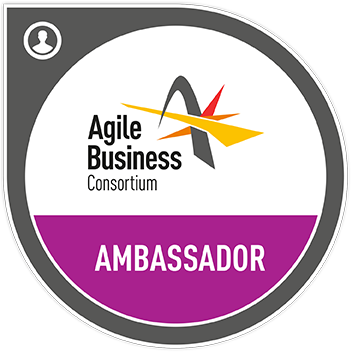 Agile Business Consortium Ambassadors are a select community of hand-picked Business Agility professionals from around the world. This individual has exceptional knowledge of Agility and the work of Agile Business Consortium and can clearly guide people and organisations to Consortium resources, tools, training and membership. Consortium Ambassadors are trusted advocates for the Agile Business Consortium and can be approached to speak or write on Agility topics and the work of the Consortium. Has demonstrated significant experience within their region in Agile and/or Business Agility, through coaching, training or their own consultancies. Actively participating in sharing knowledge with the Consortium, including, for example, blogs, articles, webinars, and meetings, as well as representing the Consortium at events in their regions and elsewhere.